NEW Limited Edition White Dare to Dream EXP Kite Package AVAILABLE NOW! Revolution Kites and Connor Doran presented the Dare to Dream Black EXP Kite Package as a great collectors and beginners package the beginning of 2011. 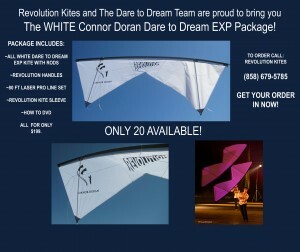 Many requests came in for a White Dare to Dream Edition EXP Kite due to Connor’s performances on America’s Got Talent. We heard you, and we listened! Now you can purchase the outdoor EXP Connor Doran Dare to Dream White Edition Kite Package! There are ONLY 20 kites being created in this edition and they will be sold on a first come first serve basis. Get your order in FAST! GET YOUR ORDER IN NOW. WE JUST GOT GREAT NEWS TODAY. KITES HEADING TO ALL CORNERS OF THE WORLD !